Hello friends! It's been a while since my last blog. I have some fresh and new things to share with you today! I know it is a Sunday morning but while waiting for my day to start, i thought of blogging this today! I was in Singapore from 15-18th November 2016 and while i was there, i took some night time strolling from 8-9pm at Orchard road, entering one shop to another at ION Orchard, Ngee Ann and Wheelock. Of course, SEPHORA was one of the must visit shop as it's nearly Christmas and i really wanna see what do they have in stores. 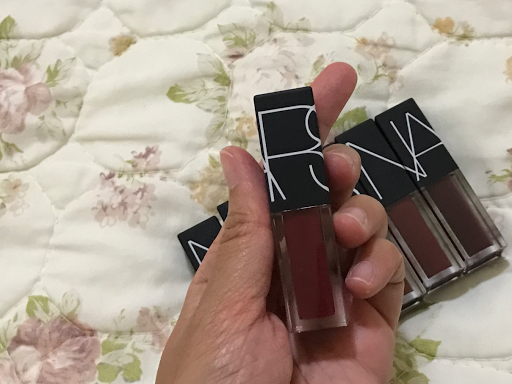 My first Sephora encounter was in Suntec Mall, where i actually bought these inviting NARS liquid lipsticks. 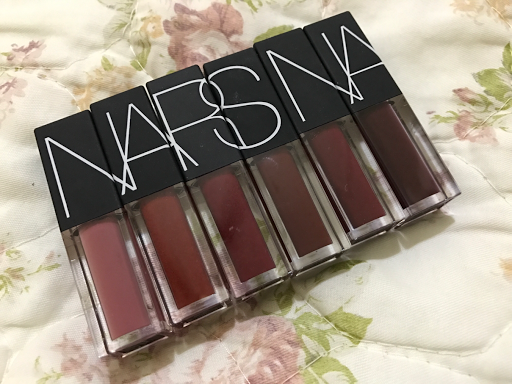 I have not been following NARS latest products and i think their liquid lipsticks are their latest invention (if im not mistaken). I saw someone from Youtube making a review about their liquid lippies and she was quite disappointed with it (Tati who was doing the review) well, i might as well give it a try myself. 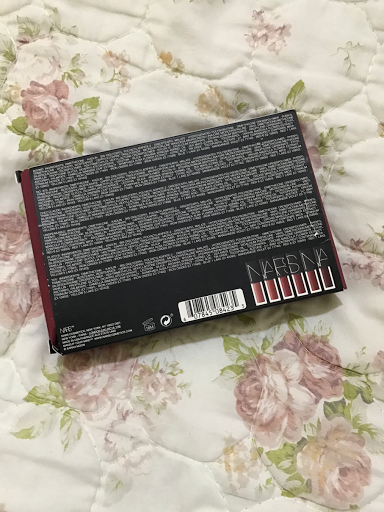 It comes in a beautifully decorated box, with all the informations on thr lippies at the back of the box. Sarah Moon is actually a French Photographer. She was initially a model back in the days. All of her collections are pretty awesome and really really nice to wear during winter time. The shades, colors are just winter colors with one or two of some neutrals. 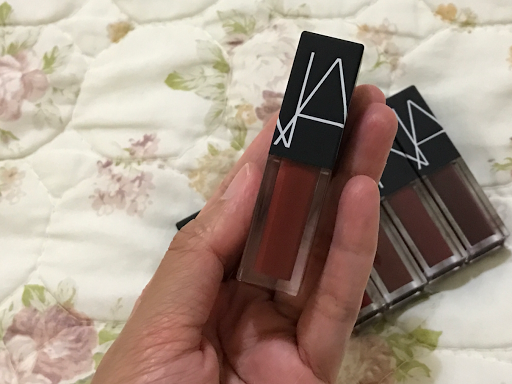 As the picture has spoken, most of the shades in this liquid lippies collections are more darker. 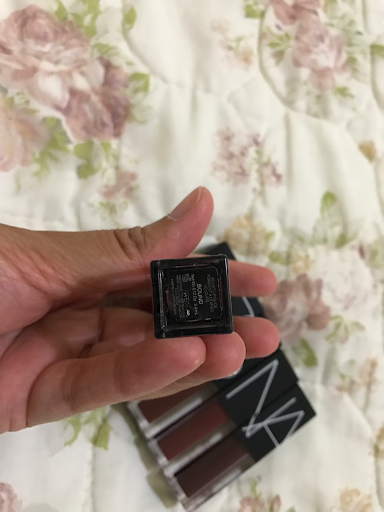 It can be used as a daily lip color for those who are bold enough just like me. Haha. I love darker shades lipstick cause it makes my lips looking very big and thick. 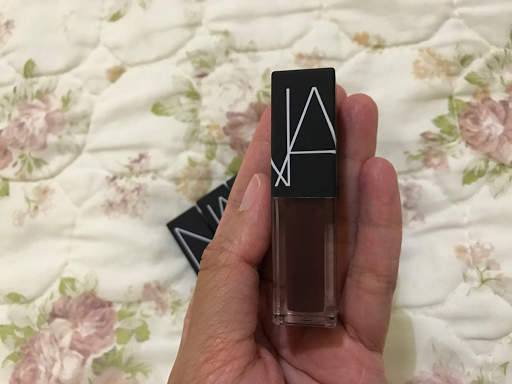 The liquid lipsticks are nicely packed in a plastic case as such with NARS emblem written on top. Just a little close up on the lipsticks without the plastic case. It has more brownish colors inside this collection. Only few reds. Lets go one by one on the color. The first shade is Bound. It is more on the mauve pink shade. This one may look the best to wear during winter/everyday look. 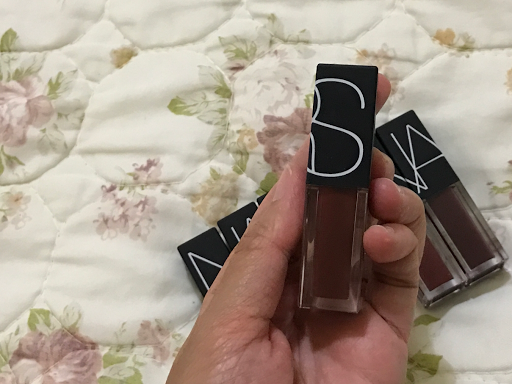 The second shade was named No. 675. Quite strange name for a lipstick but not a strange color for me. This is more on the dark maroon shade. Next inline we have Chez Claude. 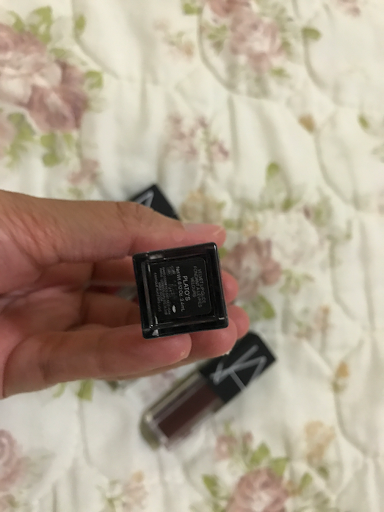 A very dark red-brown color. 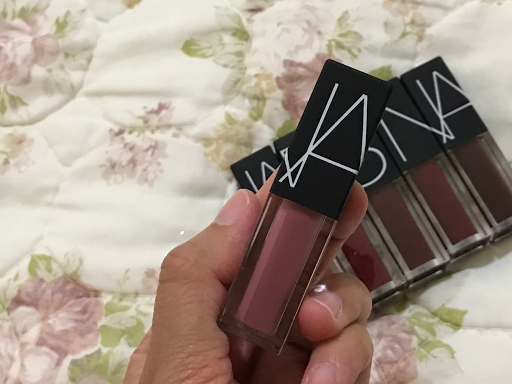 Mostly, the shades inside this collection is more on red and dark brown or in the middle. Now we have Unspeakable. The shade is pretty dark brown. Looking very antique-y and very suitable for winter wear. Loving the color! 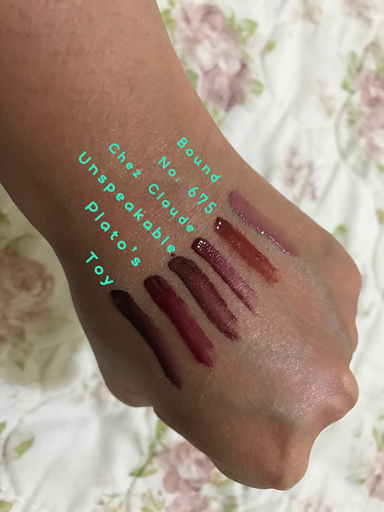 If you are ever wondering how to speak like Plato, well here's one lippies for you to wear and at least have it like Plato. Haha. This color is super dark maroony-brown. Last but not least, the most cutest name for a lipstick is the shade Toy. 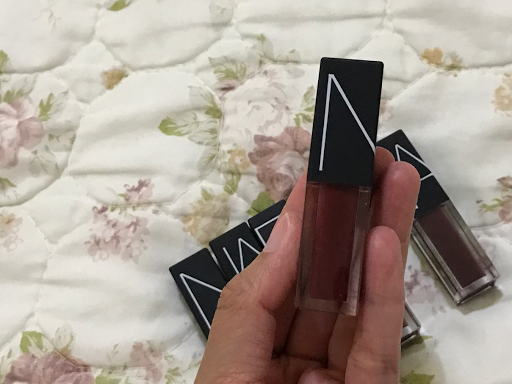 This shade is the darkest among all the shades here in this collection. More on a very dark brown shade. 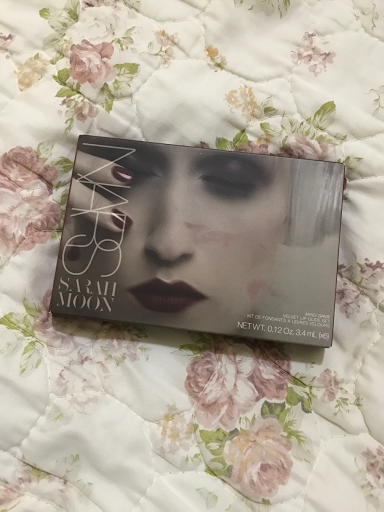 Lets see all the swatches! Pretty? Not so? 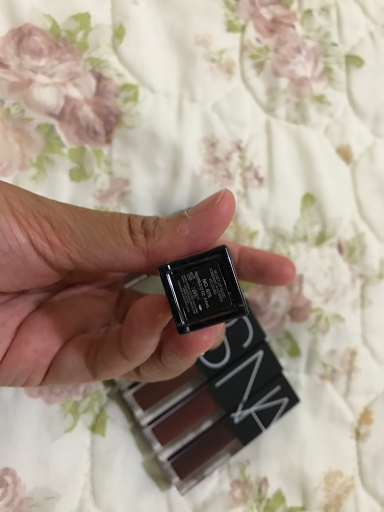 I was falling in love with the dark shades as i love love love darker shades lipsticks and all of these i could rock it everyday! I used ro wear some weird shades at work, so these are not so weird at all. I have tested two shades so far in this collection, Unspeakable and No. 675. Sadly to say, i really like the consistency and the feelings of thr lipsticks on my lips but i dont like the lasting power at all. I mean, i can truly understand Tati now. 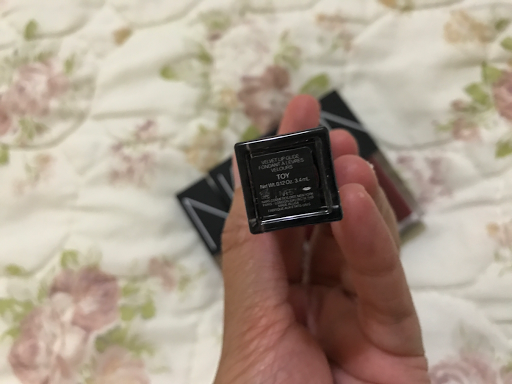 She said, as for a very well known makeup brand, NARS could do much better on the lasting power of these liquids. Is it still worth the buying? Well, if you like liquid lipstick and would want it to be as lasting as the TooFaced Melted, this is definitely not your purchase. 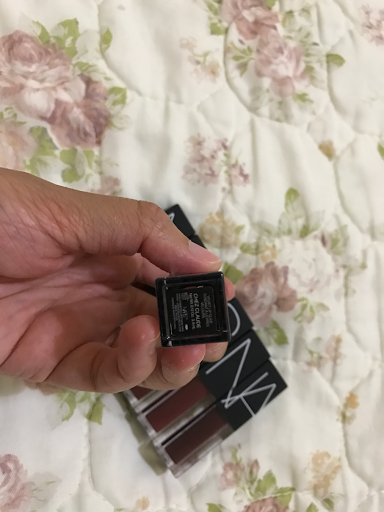 The colors are pretty much nearly the same and for SGD 80 (bought it in Singapore, i am not sure now much it worth in MYR) if you convert it to MYR it could costs you RM 250, this is not something that i would purchase here in Malaysia. 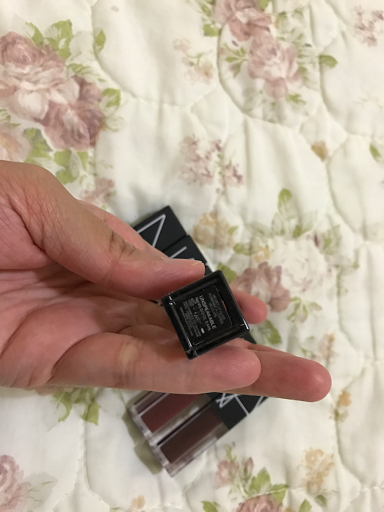 The liquid lipsticks are super small (i like the sizes by the way, handy and easy to have around during travelling), 3.4mL each of products, you do your own math. 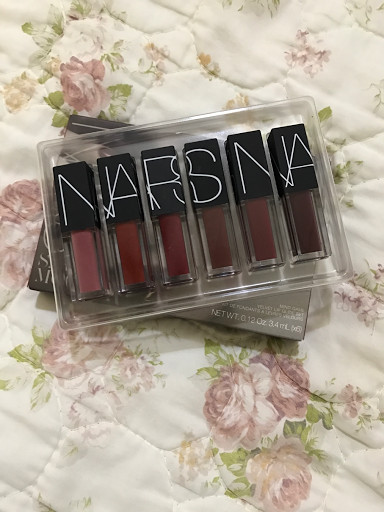 But, i dont regret buying these as i could use my 10% Sephora discounts in Singapore whereas here in Malaysia i might need to pay full price cause there's no NARS selling in Sephora. Well, there goes my thoughts on this palette.